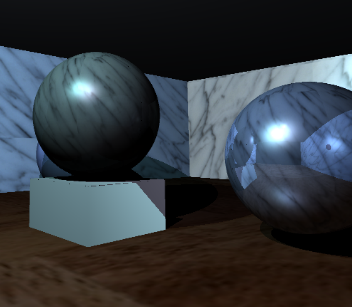 Welcome to the sixth installment of my ray tracing column. This time I would like to fix some things that I left out earlier: Texturing and a camera. 1.Pick a random vector V.
2.Now the first perpendicular vector to the reflected vector R is RN1 = R cross V.
3.The second perpendicular vector is RN2 = RN1 cross R.
There are some obvious cases where this will not work, but these are easy to work around (e.g., if V = (0,0,1) and R = (0,0,1) then you should pick (1,0,0) for V instead). Also, related to this: The correct term is 'glossy reflection', rather than diffuse reflection. Now that the bugs are out of the way, let's proceed. Perhaps it's good to explain the way these articles are written: Three months back I started working on a raytracer, after reading lots of stuff during my summer holidays. The stuff that interested me most is global illumination, so I pushed forward to get there as fast as possible. This means that I didn't really take a 'breadth-first' approach to ray tracing, but instead built more advanced features upon a simple basis. The raytracer that you see evolving with these articles used to be a very stripped-down version of my own version, with bits and pieces of the full thing being added every week. Last week I added the first feature to the 'article tracer' that was not in the original project (the diffuse reflections). And now I feel it's necessary to add texturing and a free camera, which I also didn't implement yet. So far we have worked with a fixed viewpoint (at 0,0,-5) and a fixed view direction (along the z-axis). It would be rather nice if we could look at objects from a different perspective. In modeling packages like 3DS Max this is usually done using a virtual camera. 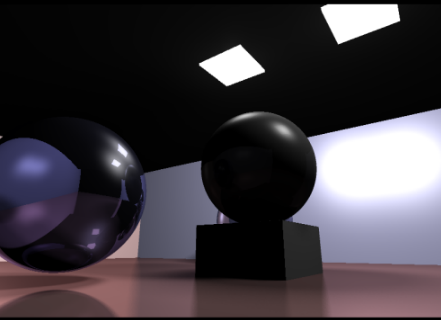 In a ray tracer, a camera basically determines the origin of the primary rays, and their direction. This means that adding a camera is rather easy: It's simply a matter of changing the ray spawning code. We can still fire rays from the camera position through a virtual screen plane, we just have to make sure the camera position and screen plane are in the right position and orientation. Rotating the screen plane in position can be done using a 4x4 matrix. A convenient way to control the direction of the camera is by using a 'look-at' camera, which takes a camera position and a target position. 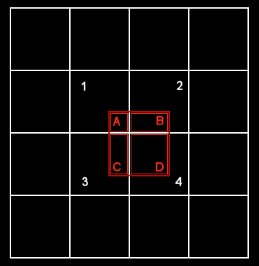 Setting up a matrix for a look-at camera is easy when you consider that a matrix is basically a rotated unit cube formed by three vectors (the 3x3 part) at a particular position (the 1x3 part). We already have one of the three vectors: The z-axis of the matrix is simply the view direction. The x-axis of the matrix is a bit tricky: if the camera is not tilted, then the x-axis of the matrix is perpendicular to the z-axis and the vector (0, 1, 0). Once we have two axii of the matrix, the last one is simple: It's perpendicular to the other two, so we simply calculate the cross product of the x-axis and the z-axis to obtain the y-axis. Also note that the rotation part of the matrix needs to be inverted to have the desired effect. The matrix is used to transform the four corners of the virtual screen plane. Once that is done, we can simply interpolate over the screen plane. Here is a screenshot of the new camera system in action. Also note the cool diffuse reflection for the floor. Looking at the screenshot at the end of the previous paragraph, I really wonder why anyone would want texturing anyway. Graphics without textures have that distinct 'computerish' look to them, a lack of realism that just makes it nicer, in a way. I once played an FPS (I believe it was on an Amiga, might even have been Robocop) that didn't use any texturing at all; all detail like stripes on walls was added using some extra polygons. I have added some extra code to accommodate this. First, a texture class: This class loads images from disk, knows about things like image resolution and performs filtering. To load a file, I decided to use the TGA file format, as it's extremely easy to load. A TGA file starts with an 18 byte header, from which the image size is easily extracted. Right after that, the raw image data follows. The texture class stores the image data using three floats per color (for red, green and blue). This may seem a bit extreme, but it saves expensive int-to-float conversions during rendering and filtering, and it allows us to store HDR images. Scaling the texture is now a matter of stretching the u-axis and v-axis for the plane. This is done by multiplying the dot product by a scaling factor, which is retrieved from the Material class. This procedure works well, and we can now apply textures to the walls, ceiling and floor. Note however that this is actually a rather limited way of texturing: We can't set the origin of the texture, and we can't specify an orientation for the texture. Adding this is straightforward though. Ouch. That looks like an old software rasterizer. We can easily solve this by applying a filter. There are many filtering techniques, but let's have a look at a simple one: the bilinear filter. This filter works by averaging 4 texels, based on their contribution to a virtual texel. The idea is illustrated in figure 1. The pixel that we would like to fetch from the texture is shown as a red square in the above image. Since we can only get textures at integer coordinates, we get one pixel instead; probably the one labeled as '1' in figure 1. Bilinear filtering considers all four texels covered by the red square. The color value of each texel is multiplied by the area that it contributes to the full texel, so '1' contributes far less then '4'. This time the texturing is blurry... Obviously, bilinear filtering is not going to fix problems caused by low-resolution textures, it merely makes it less obvious. Bilinear filtering works best for textures that are the right resolution, and also improves the quality of textures that are too detailed: Using no filter at all would result in texture noise, especially when animating. Finally, let's look at spheres. To determine u and v coordinates at an intersection point on a sphere, we use polar coordinates, r (the radial coordinate, or latitude) and T (the angular coordinate, or polar angle, or longitude). One last thing that I would like to discuss briefly in this article is importance sampling. 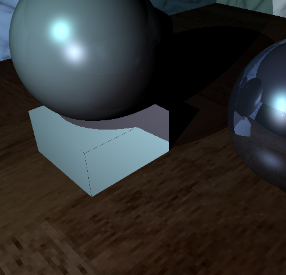 A recursive raytracer spawns secondary rays at each intersection point. In case of soft shadows and diffuse reflections, this can result in enormous amounts of rays. An example: A primary ray hits a diffuse reflective surface, spawns 128 new rays, and each of these rays probe an area light using 128 shadow rays. Or worse: Each of these rays could hit another diffuse reflective surface, and then probe area light sources. Each primary ray would spawn an enormous tree of rays, and each secondary ray would contribute to the final color of a pixel only marginally. This situation can be improved using importance sampling. For the first intersection, it's still a good idea to spawn lots of secondary rays to guarantee noise-free soft shadows and high quality diffuse reflections. The secondary rays however could do with far less samples: A soft shadow reflected by a diffuse surface will probably look the same when we take only a couple of samples. 'a_SScale' is multiplied by 4 in this recursive call to Engine::Raytrace, sine the contribution of individual rays increases by a factor 4 if we take 4 times less samples. 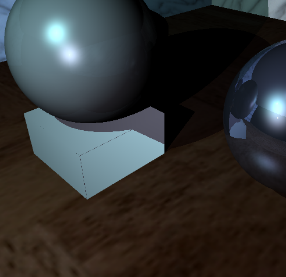 In the new sample raytracer included with this article, perfect reflections spawn only one half of the number of secondary rays that primary rays cast; refracted rays also lose 50% of their samples, and diffuse reflections skip 75%. This is only a very simple implementation of importance sampling. You could tweak importance of new rays based on material color (reflections on dark surfaces will contribute less to the final image), on reflectance (a surface that is only slightly reflective requires less precision), the length of the path that a refracted ray takes through a substance and so on. Camera's, look-at matrices, texturing of planes and spheres, bilinear filtering and importance sampling (this article). For most of these topics I only scratched the surface of what you can do. For example, besides bilinear filtering there is trilinear filtering and anisotropic filtering, to name a few. You could spend a lot of time on a subject like that. The same goes for Phong: This is really a relatively inaccurate model of how light behaves in real life. You could read up on Blinn or Lafortune, for better models. For the next article I have some very good stuff for you: Highly optimized kd-tree code, pushing the performance of the ray tracer to 1 million rays per second on a 2Ghz machine. The scene from article four is rendered in 1 second using this new code. I will also show how to add triangles to the scene. After that, I have a problem: The writing has caught up with the coding. This means that I am not sure if I will be able to keep the pace of one article each week after article 7. I'll keep you informed.